A Shepherd's Heart: Life Experience Reflection: How People Treat You! I have often learned the truths contained in the quote the hard way. 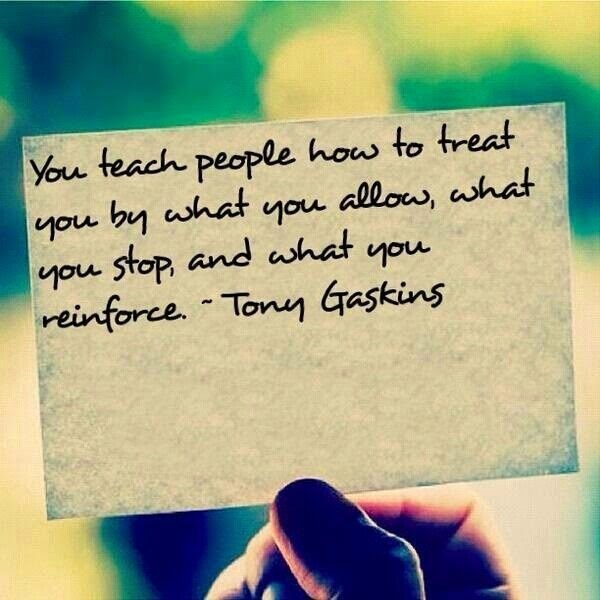 Whether your young or old, we tend to condition ourselves and others regarding how they can treat us. You have to set clear boundaries and you are not here on earth to be a doormat for those who have wrong intentions, big egos, are only looking out for their own gain, are trying to compensate for their own inadequacies, are trying to appear more important than they really are those who constantly mistreat you or tear you down or simply are uncaring and unloving to you! You don't have to take it and you don't have to be a jerk in response but you can with respect (something some people just don't have) and even love you can let others know what you will allow going forward, what you are putting a stop to now and then constantly reinforcing that. Sometimes you have to be out of your comfort zone and step it up a notch and clearly and sometimes strongly communicate these things to those who continually cross boundaries. At this point in my life, I'm not an expert at this but I purpose to learn from my past lessons/mistakes and have a deeper resolve to clearly communicate how I should be treated by what I allow, stop and reinforce. I hope you do the same too. Now, for those who may get their feathers ruffled and may try to jump all over me and say but "wait a minute... "Jesus was a peace loving pacifist, a compassionate and peace loving person, etc etc." "He would just simply pray things got better and be a peace loving doormat for people". Um, Well, Yes He was and is the Prince of peace, and He does love us even when we screw up royally, but if you read your Bible - you'll also see that in Love He also put some in their place too. He wasn't some pacifist or peace loving hippie that some may try to paint a picture of Him. Don't get me wrong, you have to insert wisdom here and sometimes you have to choose to not speak or address it at that moment but I guarantee you, if you continue to just be quiet all the time, it will never get better for you or the other party! Just remember, we're all in this together and YOU are an important part of that "together" too!